Though I am by no means of opinion that running red-deer with the rough deer-hound is so exciting or so satisfactory a sport as stalking the noble animal, and attacking him in his fastnesses with the aid only of a rifle, I have sometimes seen runs with the deer-hounds which fully answered all my expectations. It much oftener happens, however, that after the first start nothing more is seen of dogs or deer until they are found at bay in some rocky burn or stream, the whole run having taken place out of sight of the sportsman. Moreover, the dogs run a great risk of being disabled and injured either by the stag or by the sharp and rugged rocks and stones over which they take their headlong course. The deer-hound is so noble and handsome an animal, that, independently of his actual and marketable value, he is invariably a pet and favourite of his master, so that any accident which happens to him is the more regretted. With good management the experienced stalker can generally secure his dogs from running at young deer or hinds unfit to be killed. Indeed, many deer-hounds have a wonderful instinct in singling out the biggest head of horns in a herd of deer, and in sticking to this one, regardless of the rest of the herd. It will often happen, however, that the dogs set off after some hind or young stag, who leads both them and you away a long chase, unsatisfactory both in its commencement and termination, disturbing the ground and taking up twice as much time as would be required to kill the fine old ten-antlered stag, whose head you covet for your lobby, and whose haunches you wish to send to your English friend, to show him what size a mountain-fed stag will grow to. A large heavy hart is also much sooner blown and brought to bay than a younger and lighter deer. The breed of deer-hounds, which had nearly become extinct, or at any rate was very rare a few years ago, has now become comparatively plentiful in all the Highland districts, owing to the increased extent of the preserved forests and the trouble taken by different proprietors and renters of mountain shootings, who have collected and bred this noble race of dogs, regardless of expense and difficulties. The prices given for a well-bred and tried dog of this kind are so large, that it repays the cost and trouble of rearing him. Fifty guineas is not an unusual price for a first-rate dog, while from twenty to thirty are frequently given for a tolerable one. My object, however, in commencing this Chapter was not to enter into a disquisition concerning greyhounds, but to describe some of their performances, which have fallen under my own observation, and which I noted down at the time. September 22, 18—.—Started this morning at daybreak with Donald and Malcolm Mohr, as he is called (Anglicè, Malcolm the Great, or big Malcolm), who had brought his two deer-hounds, Bran and Oscar, to show me how they could kill a stag. 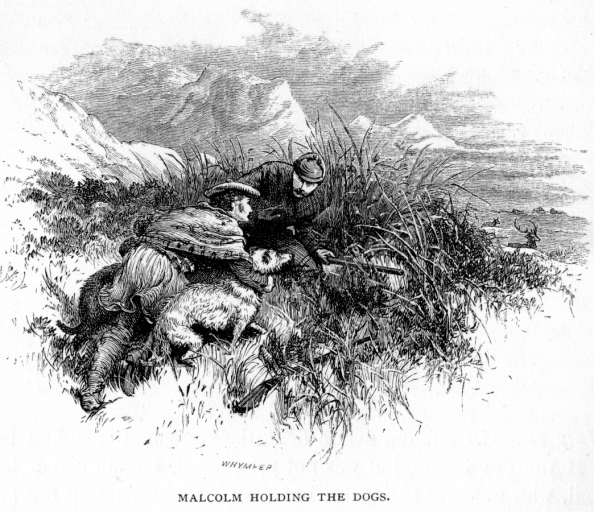 Malcolm himself is as fine a looking "lad" (of thirty-five years old, however), as ever stepped on the heather; a head and shoulders taller than Donald, who, for this reason, and I believe for no other, affects to treat his capabilities as a deer-stalker with considerable contempt, always ending any description of a sporting feat of Malcolm's with the qualification, "'Twas no that bad for so long-legged a chiel as you." The dogs were perfect. Bran, an immense but beautifully made dog, of a light colour, with black eyes and muzzle; his ears of a dark brown, soft and silky as a lady's hand, the rest of his coat being wiry and harsh, though not exactly rough and shaggy like his comrade Oscar, who was long-haired and of a darker brindle colour, with sharp long muzzle, but the same soft ears as Bran, which, by the by, is a distinctive mark of high breeding in these dogs. Malcolm Mohr and I took no guns with us; but Donald, as usual, had his old "dooble barrel," as he calls it, an ancient flint-and-steel affair; the barrels by Man-ton, and therefore excellent when you could get them off, which the stock and locks, apparently the workmanship of a Highland carpenter and blacksmith, generally prevented me from doing, the triggers being inaccessible to any ordinary fore-finger, and the stock about half the length of any other gun-stock that ever came in my way. Donald, however, was in the habit of relating great feats which he had performed amongst red-deer with this gun, and he always coddled it up with great care from wet or damp, either when laid up in ordinary at home or when carried by himself over mountain and glen. On the present occasion he had a very snuffy and dirty-looking cotton handkerchief tied over the muzzle, and a footless stocking knotted over the locks, to keep out the morning mists. Our path for some time was along the course of the river, where the great yellow trout were plainly to be seen in the perfectly clear water, waiting for the insects as they fell off the weeping branches of the birch-trees which overhung the still pools, as if admiring their own elegance in the water, where every leaf was as plainly reflected as it would have been in the costliest mirror; and as we made our way up the hill-side the autumnal air felt fine, fresh, and exhilarating. On coming out of the scattered wood which clothed the glen on each side of the stream, we saw a fine roebuck feeding in a grassy spot a few hundred yards out of the wood. I and Donald also were much tempted to run the dogs at him, as he was so far from cover; but as Malcolm voted against it, I yielded, though Donald was obliged to take sundry pinches of snuff before he quietly acquiesced in my determination to leave the buck unmolested. As we edged off from him in order that the dogs might not see him and be tempted by his starting off to break away from us, the buck lifted his head, and Bran's quick eye immediately caught sight of him; and the dog stood immovable, with his ears erect, and one fore-foot raised from the ground. The sensible creature, however, instead of straining at his leash, looked up inquiringly at his master, asking him plainly, "Am I to chase that beauty?" Oscar, who was trotting quietly behind Donald, who held him, seeing that Bran had game in view by his manner of gazing, and following the direction of his eyes, also saw the buck. Not being so well broken as Bran, he no sooner saw the buck than he sprang forward, pulling the old keeper down on the flat of his back. Luckily, Donald had the strap twisted round his arm, or the dog would have escaped after the deer. As it was, Donald managed to hold him, and having got up, rubbed his back, and vented his ill-humour in numberless Gaelic imprecations against the dog for upsetting him, and against Malcolm, "the muckle fule," as he called him, for laughing at his mishap, he got under weigh again. In the meantime the roe had disappeared down some hollow of the ground, and we proceeded on our way. After leaving the woods, we traversed a long range of broken ground, where we had but small chance of seeing the deer though their tracks were tolerably fresh here and there; our object was to find the animals in certain places more adapted for the running of the dogs than the ground we were then passing. We therefore did not examine two favourite but rugged and steep corries, where deer were generally found. Our forbearance was rewarded, for on coming to a point overlooking a long and wide stretch of hill-side, through the centre of which ran a winding but not very rapid burn, we immediately distinguished nine deer still feeding, though the morning was somewhat advanced; they were scattered about a green spot at the head of the burn, and feeding on the coarse grass and rushes which grew about the springs and marsh that fed the main stream. They could not have been better placed, and after a short consultation — which, however, lasted longer than it need have done, owing to Donald's determined and customary opposition to every proposal made by his tall rival — we turned back behind the shoulder of the hill, in order to get into a hollow of the ground which would enable us to reach the course of the burn; for, this done, our task was comparatively easy. As the water, owing to the dry weather, was but shallow, and the little wind which there was, was blowing right down the stream, by keeping its course we hoped to reach the deer unobserved. Before starting, I took a good look at them through my glass, and saw that the herd consisted wholly of hinds, except one tolerably handsome stag. The dogs instinctively perceived that we had found game, and changed their careless and slouching trot for an eager and quick walk; every now and then they looked with pricked-up ears, and an inquiring glance at Malcolm's face, as if to ask him where the deer were, and how soon they would be seen. Malcolm proposed to me that Donald should get up to a height of the hill, from whence he could see for a long distance on the other side, in case the deer crossed the top, and went to bay in any of the burns that were within his view, and after a slight demur, rather at the proposer than at the proposal, Donald started off, with his " doable barrel" still carefully swaddled up under his arm. Malcolm and I proceeded carefully, though with great ease, till we got into the burn; I led Oscar, while Bran was under his guidance — we waded and scrambled with no great difficulty, excepting that now and then Oscar was a little annoyed at not being close to his master, as both dogs seemed perfectly aware of what was going on, and in momentary expectation of seeing the deer. Never was ground more favourable: till we were within four hundred yards of the deer, we had scarcely occasion to stoop our heads. Having come at length to rather a difficult pass, Malcolm asked me to look up carefully, that we might know exactly where the deer were, while he held the dogs. Raising my head gradually, I looked through a tuft of rushes, and saw first the horns of the stag, and then the heads of five of the hinds; they had lain down in the long heather, near the spot they had been feeding on. But where were the remainder of the herd ? I looked for two or three minutes in vain, keeping my head perfectly motionless. Presently, however, the rest of the deer appeared from amongst some broken ground, a hundred yards higher up the hill than the others. Having looked anxiously round them, they all dropped quietly down to rest, with the exception of one lanky-looking hind, who stood motionless on a small hillock, with her eyes and ears turned with great attention in the direction of Donald's place of ambuscade; she evidently had some kind of suspicion of danger from that quarter, though she had not yet quite made up her mind as to the reality of it. I lowered myself as gradually as possible, and looked back at Malcolm. He was kneeling on one knee with a dog held in each hand, the dogs themselves were a perfect picture as they stood, with the most intense expression of anxiety, watching my movements, and snuffing the air in the direction in which I had been looking; the wind was too light, however, for them as yet to scent the deer. As they stood motionless, and scarcely drawing their breath, I could plainly see their hearts beating with anxiety and eagerness; I explained the position of the deer to Malcolm, and we immediately agreed that no time was to be lost, lest they should take alarm at Donald, whose whereabouts the hind seemed strongly to suspect. We had a difficult task in advancing the next fifty yards with the dogs. The sensible animals, however, crouched when we did, and were wonderfully little in the way considering the nature of the ground which we had to pass. The old hind's ears were visible, but no more of her, as we crept along; she appeared to be still intently watching in the same direction as before. Having crawled over a small height, we got into a hollow place, and then proceeded to put the dogs' collars and straps in a state to enable us to slip them at a moment's warning. Both Bran and Oscar stood motionless, and almost seemed to turn their necks in order to assist us in the operation. We then advanced with great care and silence, on our hands and knees, for a couple of hundred yards along a cut in the ground that took us away from the burn. Everything had favoured us, the deer's attention had been taken off by Donald, and the ground had been the easiest I ever stalked a deer in. We were now within about a hundred yards of them, and could get no nearer unobserved; so patting the dogs, and whispering a word of encouragement to them, we led them in front of us, and rising up in full view of the deer, pointed towards them. . We had no need, however, to show their game to the noble hounds, for the deer starting up as soon as they saw us, were at once caught sight of by both Bran and Oscar. Away went the deer; those which were the farthest off waited for their comrades to join them, and then all took the hill in a compact body, and the dogs with an impatient whine darted off the instant they were released from their collars. The deer ran in a sloping direction up the hill, apparently not exerting themselves very much, but in reality getting over the ground at a very quick pace; the two dogs ran neck and neck, not exactly straight at the deer, but almost parallel, sloping a little, however, towards them, and gaining slowly, but still perceptibly, on their game. This lasted for half-a-mile or so, when the dogs had gained so much, that they were within forty yards of the deer. Nearer and nearer they approached, the hinds running in a close body, the stag now and then lagging behind a few yards, and then, with a great effort joining them again, his greater weight and fat beginning to tell on his wind. Malcolm danced and shouted with eagerness : for my own part I went along at a quiet trot, in order not to lose sight of the run in case they turned up the hill and got over the height. Presently the dogs seemed to be in the midst of the deer; and the next moment we saw the stag coming straight down the hill with tremendous strides, and the dogs ten yards behind him — Bran rather the first; his thinner coat telling in his favour. As for the hinds, they dispersed for a moment, then collected again, and went off up the hill; being intent on the stag, I saw nothing more of them; they probably did not halt till they had crossed the hill and the river too. Down came the stag at a pace and with bounds that seemed likely to smash his legs every moment. Luckily for the dogs the ground was (as it had been all along) most favourable. I lost view of all three as they got into the course of a burn, which joined the one we had come up. The dogs were then at his haunches, but unable to get hold. Bran's point of attack was always at the shoulder, or foreleg, while Oscar had a habit of biting at the hind-leg above the hock, frequently cutting through the flesh and tendons in a most extraordinary manner, and tumbling the deer over very quickly. He had, however, not yet got a fair chance at his present chase. Once in the burn, I knew that neither dog could do much, excepting to bring the stag to bay I ran as hard as I could towards them, and soon saw the deer rattling down the stream, with stones and water flying about him in all directions. The dogs were still keeping up as well as they could in the narrow and rough path the stag had chosen and sometimes springing at him, but unable to get a hold. Malcolm and myself were in great dread that they would be injured or killed. 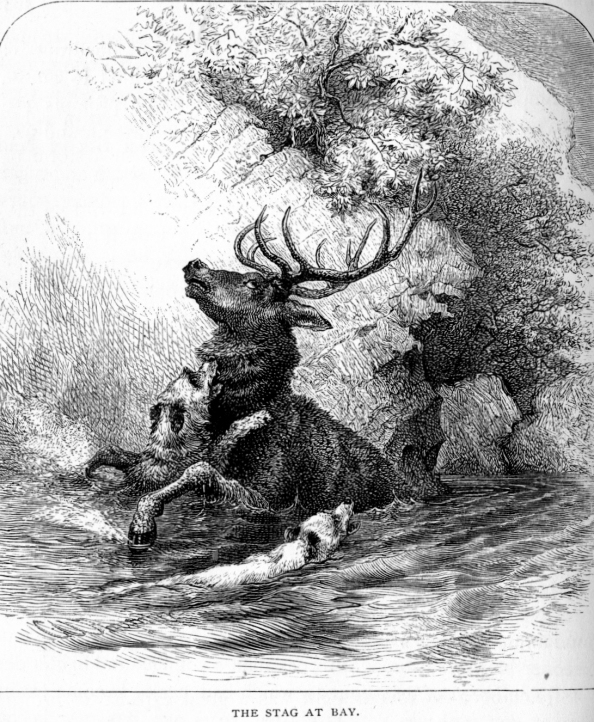 When within fifty yards of us, both dogs were thrown down, after making an ineffectual attempt at holding the deer, who broke away, and, getting a little ahead of his pursuers, came to bay under a rock in a pool of the burn which reached to his knees. The dogs had recovered themselves almost immediately, and, crouching in the water, bayed furiously at the stag, who, with his back to the rock, presented only his armed front to them. Knowing their business well, from having gained experience in many hard-fought battles, they did not risk their lives by rushing at his horns, but contented themselves by keeping him there, while they now and then looked round at Malcolm, as if to ask for his assistance. "Down, good dogs, down," he said, when, seeing us approach, they seemed inclined to rush in. The deer now and then appeared anxious to break off, but whenever he attempted to move, the hound nearest the direction towards which he turned sprang in front of him, baying and preventing his leaving the spot. Not seeing Donald and his gun, we consulted together as to what was to be done, and at last Malcolm determined, by cautiously attacking the deer from above with his stick, to make him turn from the dogs, and give them a chance of fixing on him without risk from his horns ; if they succeeded, I was to run in, and act as circumstances permitted, and, if possible, to help the dogs by stabbing the deer in the throat. As soon as Malcolm had commenced his part of the business, by going round the deer, I called off the dogs in order that they should not be trampled down by the first rush of the poor beast. They came quite willingly, evidently placing entire confidence in our manner of attack. Malcolm got just above the stag, and then flinging his heavy stick at his legs, and shouting loudly, frightened him so that he rushed out of the pool, passing close to me. "Now, then, good dogs, at him;" and the next moment the stag was tumbled over, with both hounds fixed on him — Bran at his shoulder and Oscar at his throat. I easily managed my part of the affair, and put an end to the poor animal's pain with my hunting-knife. "Well done, Sir, well done," said Malcolm; "that was quickly finished." — "'Deed, ay," said Donald, who just then came up, panting like a walruss. "No that bad either:" this being the utmost praise that he ever bestowed on any one. The hounds, as soon as they saw that the stag was quite dead, left him, and, lying quietly down, began to lick the bruises and cuts they had received in the run ; luckily there were none of any consequence. Every now and then one of the dogs would get up, and, going up to the deer, examine him all over, as if to satisfy himself that there was no life remaining. We examined the dogs' limbs to see that there was no serious strain or cut, and then, after rubbing the dirt and blood off their skins, set to work to open the deer, and dispose of the body, ready to be carried off the next day. This done, we sat down, talked over the run, and consulted as to our proceedings for the rest of the day; and as it was still early, we agreed to try some more ground, in the contrary direction to that in which the hinds had gone, and, if kept out late, to sleep at a shepherd's house some distance up in the hills. We searched many a corrie and glen in vain, till, towards evening, Donald, who had been examining the rushy ground that fringed the sides of a considerable mountain stream, in hopes of seeing some deer at feed, suddenly shut up the telescope, and as he deliberately wiped the glasses, and placed it in its case, said, without looking up, "I'm seeing a fine stag down yonder, Sir." Then having taken a long pinch of snuff, added, "He is just the beast that the shepherd up there was tailing me of last Sabbath" — Sunday being the day on which Donald invariably heard all the hill news. The evening was coming on, so having no time to lose, and a considerable retrograde movement to make before we could" approach the stag with any hope of success, off we set at once, and we had a quick and difficult march of it for nearly half-an-hour before we got into the burn, up the course of which we proposed to keep, as it led straight to the deer. The banks, however, were not so high as those of the former stream, and the water ran over loose round stones, which made our task much more difficult We were within five hundred yards, and had got over the worst of our ground, when, on looking up, we saw the deer trotting deliberately but steadily up the hill away from us, evidently having been moved by some suspicion of danger, though we were positive he had not seen or scented us. "See to that; the brute is clean gone," said Donald; and, indeed, clean gone he was for that evening, as just then we lost sight of his antlers as he got over the crest of the hill. On taking the glass, and examining the whole country round, I soon saw the object of his alarm in the person of the very shepherd whose house we were making for. The man was passing at some distance on his way homewards, quite unconscious of our presence or the mischief he had done, as he trudged along towards us with his plaid over his shoulder, and his two colley dogs trotting slowly at his heels. " Oh, but we'll give him a bonny fleg for spoiling our sport the night," said Malcolm. Accordingly Donald and he concealed themselves in the burn, one above and the other below the point at which the shepherd appeared likely to cross it, while I remained hid in a hollow of the moss, a quiet spectator of their attack on the poor fellow's nerves. The shepherd had just put his foot in the burn, when Malcolm shouted at the top of his voice, "Willie Young, Willie Young,"' this being the man's name. He stopped short, and with a frightened look at seeing no one, was going on his way again, when Donald took up the chorus, "Willie Young, Willie Young." "Wha's you?" said the shepherd, turning towards Donald. "Willie Young, Willie Young," then shouted Malcolm, and at his voice the unhappy proprietor of the name wheeled round as on a pivot. I could not refrain from joining in the persecution, and Willie Young was kept for ten minutes, turning from side to side, on hearing his name called by his unseen tormentors, till he got so terribly frightened that I thought it as well to show myself, or I firmly believe the man would have gone mad. I never saw a poor fellow more relieved in my life than he was on seeing that his persecutors were mere flesh and blood like himself, and not spirits of the air or flood as he had imagined. Having laughed at him for his fright, and appeased his somewhat reasonable anger, we found out from him that this stag was constantly about the same place, and had got so accustomed to seeing the shepherd pass to and fro, that he invariably returned to the same glen within a few hours. It was getting late, so we postponed attacking him till the next morning. The shepherd also told us that although the stag had not particularly fine antlers, that he was one of the heaviest and largest deer that had been in that part of the country for some years. He knew him by his large track, and also by his colour, which was peculiarly light. We accompanied Willie Young home to his domicile; and having taken our frugal supper of porridge and milk, followed, however, by some whisky-and-water of no mean flavour and strength, which Mr. Young informed us in confidence had been made by some "lads down the glen yonder," we retired to our sleeping-places. For my own part, I took up my quarters in the building dignified by the name of barn, where, rolled in my plaid, and burrowed in the straw, I slept free from the ten thousand nightly visitants called fleas, which would have eaten me up in Willie Young's house, where, on a former occasion, I had discovered that they rivalled the celebrated plague of Egypt in number and power of tormenting. My two attendants, Donald and Malcolm, slept somewhere near me, as I heard them talking till a very late hour, probably consulting about their plans of attack for the next day. Before the sun was above the heathery brae which was to the east of us, I looked out and saw the opposite mountain tops already lighted up, and illuminated in the most beautiful and fanciful manner — the glare catching the projecting peaks and angles, and throwing the other parts of the rocks and heights into the deepest shade. Donald was sitting on a stone, rubbing his eyes and his gunlocks alternately with his ancient "pocket napkin," as he called it. Malcolm and the shepherd were leaning against the corner of the house chattering Gaelic, while the rather pretty wife of the latter, bare-headed and bare-legged, was coming over from the cow-byre with a tin pail of fresh and frothing milk. "I hope your honour slept weel; I'll be taking your breakfast ben the house directly," said pretty Mrs. Young. The two hounds were yawning and stretching themselves in front of the door, and received me with a joyful though rough welcome, Bran putting his front paws on my shoulders, and Oscar almost knocking me down by running and rubbing against my legs. The shepherd's two colley-dogs were standing down at the burn side with their tails between their legs, barking and howling at their unusual four-legged visitors, who occasionally looked, first at the colleys and then at me, as much as to say, "Shall we punish their impertinence, or not?" One word of encouragement would have sent the two hounds full chase after the yelping curs. Breakfast done, we started to look for the stag. The shepherd went with us, anxious to see the sport, and we were glad of his assistance in finding the deer, as he was so well acquainted with the animal's haunts. On our way he told us that he had no doubt we should at once find him, but that the dogs would have hard work to kill him, as he was an old cunning fellow, and was supposed to be the same stag who had killed the greyhound of Rory beg, the fox-hunter, last year in a corrie at some distance off. The dog having got after the deer (as Rory said, by accident! ), and being close alongside of him, was killed dead on the spot by a single blow of his antler; the stag having struck him without stopping, simply turning his head and striking him as he ran alongside. We examined the glen where we had seen the deer, but without success; no mark of him was to be seen. The shepherd, however, told us to wait till about nine o'clock; it was nearly that hour now, and he would probably be seen coming in to lie down for the day, on the slope of the hill above the burn. We accordingly lay down quietly in a concealed place, and, as he had predicted, we presently saw the magnificent fellow appear on the top of the hill, where he halted for full ten minutes, looking carefully over the glen in order to see that it was free from any enemy. The morning sun shining on his bright hide made him look of even a lighter and brighter colour than he really was. His horns, though not exactly of first-rate size, loomed large and wide, as seen in clear relief between us and the sky. After standing some time, looking like the solitary spirit of the mountain, he seemed to have made up his mind that all was right and safe, and he walked slowly and deliberately half-way down the hill, and after stopping again to reconnoitre for a short time, he dropped at once down into the heather. I watched him for a few minutes through the glass, as he lay motionless, excepting that now and then he turned his horn down to scratch a fly off his side, or shook his ears when the gnats were particularly troublesome about his head. We saw that he had taken up too wary and commanding a position to admit of our approaching him with the dogs ; so after some consultation, and, as usual, much opposition from Donald, we adopted my plan of driving him, taking the chance of his leaving the glen at his usual pass, where Malcolm and I were to hold the dogs. The shepherd was to move him; and Donald was to be placed with his gun in a burn over the hill, to which we judged he would probably run, and go to bay, when pressed by the hounds. Donald, having loaded his gun with an immense charge of slugs in one barrel and a ball in the other, started off. The shepherd took a long circuit to get below the deer, while Malcolm and I took up our post in a capital hiding-place near the line by which the game had entered the glen. There was not a breath of wind blowing from any direction everything was as calm as it could possibly be, so that although we had no fear of being scented by the stag, we had to take the extremest care not to make the least noise in going to our place of ambuscade. We held the dogs in our handkerchiefs as the quickest way of slipping them. The stag was easily seen without much risk of his observing us, as we looked through a crevice in the rocks. After waiting an anxious half-hour or more, we saw the deer suddenly spring up, and, after standing at gaze for a moment, trot up the hill, but not exactly in our direction. He came to a flat spot, and then halted again, and looked earnestly down into the glen. The shepherd was now in full view, and the deer having looked at him fixedly for a minute, seemed to recognise an old and harmless acquaintance; and then turning, trotted deliberately, at no great pace, straight towards us. We heard every step he took as he trotted up the hard hill-side; now and then he crossed a sloping piece of loose gravel which rattled as his hard hoofs struck the stones, and at one time he had to pick his way through a wet splashy piece of marsh, which he did deliberately and slowly, occasionally looking round at the shepherd below him. At this time we could not move or lift our heads for fear of being seen, but had to wait till the deer had passed the rocks amongst which we were concealed, that we might let slip the hounds at a distance of about thirty or forty yards. The deer was now close to us, not more than ten yards off, but we did not want to let the dogs go for fear of turning him back again into the valley from which he had come, where the ground was not nearly so favourable for the dogs as the slope on the other side of us. We heard him tramp past us as he trotted slowly along on the other side of the rocks behind which we were concealed. The next moment he had cleared the rocky ground, and was in full view about thirty yards from us, on a wide expanse of good heather-ground. The dogs saw him too, and getting to our feet, we slipped them. With one affrighted glance behind him, away went the stag, at first along the top of the slope, as if anxious to keep above the dogs; but finding himself hard pressed, he turned his head down the hill, and the race began. Down they went, the dogs close on the stag. Now and then they tried to spring on him, but his strength and quickness always enabled him either to shake them off or to elude them; indeed, after running for some distance he seemed rather to gain on the dogs than to lose ground. Finding this, they seemed more intent upon trying to tire him out than to seize him, and galloped along, keeping somewhat above him, as if to drive him into the burn, where he would come to bay. The stag tried again to ascend the slope, but could not manage it; his wind began to fail, and he turned straight down, gaining a little on the dogs. Crossing some rather wet ground, they were again up to him, and he only escaped being pulled down by his great strength, which enabled him to shake off the hounds more than once. It was clear that his object was now to gain the burn. All three were evidently beginning to fail, as the chase had already lasted some time. Malcolm and I had now reached the burn also, having made for it in a straight line as soon as the dogs were slipped. As luck would have it, deer and hounds all passed us down the stream, the dogs panting, and the deer with his tongue hanging out and blowing like a porpoise. He soon came to bay, and the dogs were glad to get a rest, and lying down in the water, opposite his head, they alternately bayed at him, and rolled in the stream to cool themselves. We came up, and the deer immediately broke his bay, and rushing over the dogs, trampled them under foot, and striking Oscar a sharp blow (which luckily only grazed him) with his antler, took down the stream again. We looked round for Donald, and presently saw him crouched on a rock immediately above the stream, and about two hundred yards below us. The dogs recovered quickly, and were again close on the stag. He stopped two or three times for a few moments, turning fiercely on the hounds, and at last came to bay in a determined style, under the very rock where Donald was concealed. The next moment we saw the deer stagger and fall in the water, and immediately heard the report of Donald's gun. Before the stag could recover, both hounds were on him worrying at his throat like bulldogs, and after one or two efforts to rise, the poor animal's head sank into the pool, which was soon red with the blood that bubbled up from his mouth and nostrils. Donald had shot him just behind the heart with his single ball, which had cut the large blood-vessels. "Puir brute, puir brute, it's just a sorrow to see him," said Malcolm : and now that the excitement of the chase was over, I also would have given much to have been able to bring the gallant animal to life again. We got him out of the water, and were soon joined by Willie Young, who sighed more than once, and took a vast pinch of snuff out of Donald's box, half sorry to see his old acquaintance, the white stag, as he called him, lying dead and bloody on the heather. As Oscar had got a rather awkward, though not very deep cut, and Bran seemed rather the worse for his bruises, I left Donald and the shepherd to attend to the removal of the deer, and walked straight for home with Malcolm and the two dogs, who had both of them done their duty so well. Of the different runs which I have seen with deer, these two were certainly the best, both as regards our having the game almost constantly in view, and as to our being well up at the conclusion of each chase. I certainly have not had much experience in running with greyhounds; but those who have, speak with raptures of this way of killing them. For my own part, I prefer my rifle, with a good dog. A high bred, English, smooth greyhound, sometimes kills red-deer well and cleverly, having the advantage in wind and speed over the rough dogs, and also possessing the most dashing courage when in pursuit of game. They want weight, however, to enable them to pull down so large an animal as a stag; though I have seen a small greyhound tumble over a deer, and kill it very quickly, by catching the animal under the shoulder, when in full speed, which at once upset him, and then flying at the throat, he soon finished the business.